On our final day in Montréal we went back to Marché Jean-Talon. I talked it up pretty good, and Joe wanted to see for himself. 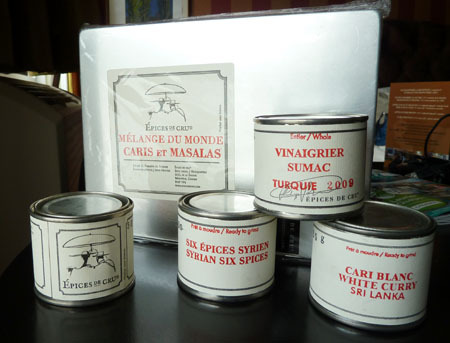 Of course, I took him to Olives et Épices and showed him the spices. I behaved myself, and only bought two more items. For lunch, we headed to Le Petit Alep. It was on my list of places to have lunch, but I just wasn’t hungry enough to go before. This worked out perfectly, because the place is adorable and a perfect place to bring J. 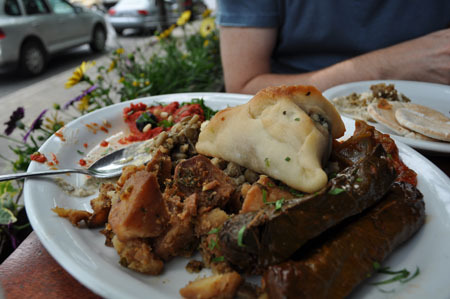 Le Petit Alep specializes in Syrian, Aleppo and Armenian Cuisines and is the baby sister restaurant to Alep, which is right next door. Interestingly, Petit Alep appears as the second top rated Middle Eastern restaurant in Montréal (according to Urban Spoon), while Alep didn’t make the top ten. I doubt it has anything to do with the food, but likely the price. Alep offers fine dining, which no doubt accounts for the higher cost. 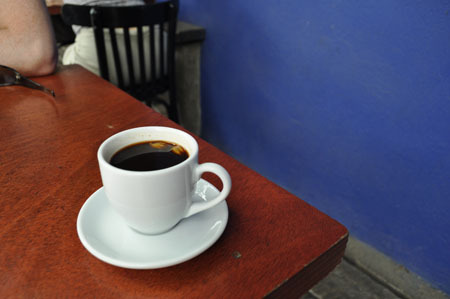 On the other hand, Le Petit Alep offers incredible food, at a great price, with a really nice comfortable atmosphere. It’s a great restaurant experience in it’s own right. I may have mentioned before that I can be frustratingly indecisive. I wanted to order one of everything. 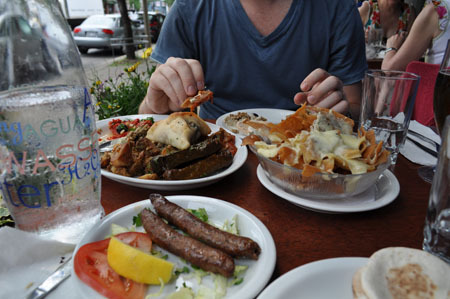 We settled on a vegetarian appetizer platter, some fried pitas with za’atar and cheese, and Armenian sausage. The waiter says to us ‘so, you’re really hungry?’. I guess we ordered a lot. The appetizer platter was partly made up of things I knew, like Hommos (chickpea dip) and Metabal (Syrian babaghanoush, puréed roasted eggplant) and Yalandji (stuffed grape leaves) – all of which were amazing. The highlight for me, though was the Mouhamara, a dip made from breadcrumbs, pomegranate molasses and nuts. It was tangy and nutty and unexpected. I need to learn how to make this. What a great way to use up breadcrumbs! 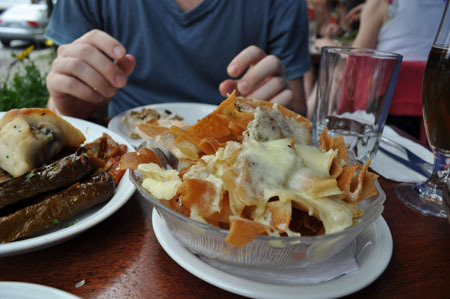 The fried pita dish was described by the waiter as being ‘Syrian nachos’, with fried pita crisps topped with seasonings and melted cheese. How can you say no to that? It was super fun. 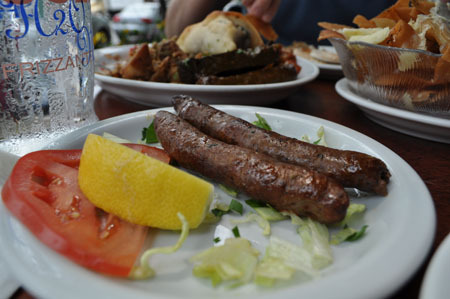 The Armenian sausage was a little inelegant looking thing, but well spiced and delicious. We were told to dip these in the sauces, which made it even more fun! To end the meal, we had Turkish coffees scented with cardamom (they were probably Syrian coffees, but I asked ‘do you guys do Turkish coffee?’, and wasn’t corrected). It was the perfect way to end the meal, and send us on our way to Québec city. Au revoir, Montréal! Au prochaine!